Consumer-direct campaigns have always eyed the 33,000,000 Canadian market. But fulfilling orders from a US-based fulfillment center to a Canadian consumer is not an easy task. Transit times are long, tracking is poor and each package must pass through customs. In many cases, the Canadian consumer must pay duties to the delivering carrier upon receipt of the item, which is not consumer friendly and results in a high percentage of packages being refused. With all of these barriers and delays, Canadian consumers are discouraged from ordering from US merchants. Also, as the time between ordering and delivery grows, the campaign experiences higher customer service costs and cancellations. Continuity programs are hit especially hard as the cycle is extended. a2b Fulfillment’s Canadian program solves these problems. By positioning product in our Toronto-area warehouse, packages ship same-day and deliver as quickly as the following day. Tracking is strong and accountable. Best of all, delivery is duty free as they are collected in advance at the time of sale (just like state sales tax). 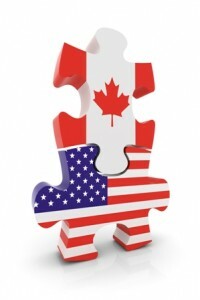 By working with a2b, marketers receive the same efficiency in Canada as a2b is famous for in the US. All activity on both sides of the border is managed in the same system and through one point-of-contact. Send us one order file and we will do all the work. Easy. Contact a2b Fulfillment today to learn more about how we can help you expand your market into Canada with little effort. We aim to be a top third-party logistics provider for fulfillment in Canada.